Thanks for the Memories and Everything Else! You can tell by the smiles on our faces that we’re all enjoying his show immensely, but oddly enough I’m the only living, breathing human being in the bunch. Everybody else is made of bronze, including Old Ski Nose himself. I’m also the only spectator who’s not in uniform, and as I look around me I see soldiers representing every conflict from the Battle of Leyte all the way to Operation Desert Storm. 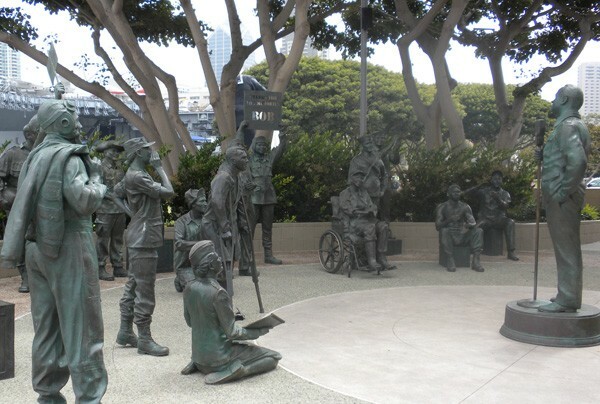 In case you’re wondering, I’m smack in the middle of "The National Salute to Bob Hope and the Military”, a fairly new memorial park that honors a man who spent almost sixty years entertaining our servicemen and women, both in wartime and in peace. But what makes this tribute so unique is that rather than simply viewing a statue or reading a plaque, visitors are literally part of the audience, as they mingle with the troops and listen to a continuous audio feed from his actual USO performances. It’s totally captivating and I’m enjoying every minute of it. Having said all that, my visit to this little park today isn’t a totally positive experience for me. It’s also a rather painful reminder of a youthful dream of mine that will never be fulfilled. You see, I always wanted to be one of those beautiful girls who went along with Bob Hope to entertain the troops. Don’t laugh. It’s true. When I was growing up, every time I watched one of his USO Christmas specials on TV, I longed to be Ann Margaret or Raquel Welch or Connie Stevens. I wanted to have long fluffy hair and wear white go-go boots and a mini-skirt and lots of eyeliner. I wanted to do the "frug” to the wild, raucous cheers of thousands of homesick sailors. I wanted to sing a duet with Bob, and engage him in witty banter that was loaded with double entendre (not that I understood half of it at the time.) I wanted to pluck some lucky fellow from the first row and bring him onstage for a kiss. I wanted to look fabulous standing next to Phyllis Diller. But most of all I wanted to do as much to thank those guys for their sacrifice and service as Bob Hope himself was doing. Sadly, perhaps because I had no show-biz connections or talent (but more likely because I was only thirteen, with braces and a flat chest) I was never asked to join the tour. Back here in the park, Hope is cracking his next joke: "The Marines and I go way back – Wake Island, Guadalcanal, Iwo Jima…yeah, I saw all those pictures.” The crowd, of course, loves it. I love it too, and could go on listening forever, but alas my popcorn’s gone and I’ve apparently reached the end of the audio loop because the laughter has just faded into that familiar theme song "Thanks for the Memories”. As I gather up my stuff to leave I suddenly find myself filled with gratitude – not only to Bob Hope for all he did for this country, but also for the way my life turned out despite not being one of the dancers on his tour. I just wish I’d ended up looking like Ann Margaret instead of Phyllis Diller. Search for See the USA! articles similar to "A Glimmer of Bob Hope. Search all articles similar to "A Glimmer of Bob Hope".